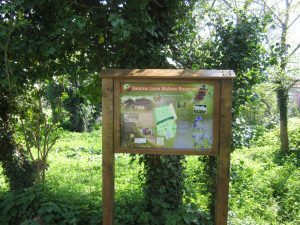 The project was conceived by members of the local community who wanted to celebrate the tenth anniversary of Swains Lane nature reserve by improving the site for all to enjoy. It was one of a number of community nature projects supported through the Blackdown Hills Natural Futures project. Blackdown Hills AONB also provided financial support to the project via a grant from the Sustainable Development Fund. The project involved installing educational displays, fitting new boardwalks by the pond, improving access, recruiting volunteers and creating a long-term plan for the site. Local individuals were given expert training to enable them to continue to manage Swains Lane for the community to enjoy for many years to come. Swains Lane which was once an orchard, has been transformed into a valuable wildlife site accommodating a variety of habitats and species. Surrounded by new housing development, the reserve is an important asset for the local community – a healthy, sensory and tranquil outdoor space, where people of all ages, can come to get some exercise, walk their dog, or simply relax and enjoy the surroundings. The site is a semi-improved grassland meadow featuring an assortment of wildflowers, herbs and grasses. A small yet productive pond has been renovated. Swains Lane is home to a thriving population of great crested newts, in addition to palmate newts, frogs and toads. The connectivity and diversity of the trees and hedges provide excellent feeding and nesting sites for birds, amphibians and small mammals such as bats. Regular sightings include slow worms, song thrush, dunnock and even a local sparrow hawk. Several old apple trees remain as a cherished feature; each spring displaying a beautiful bloom of blossom attracting a whole host of insects, bees and butterflies. New cider apple trees of local varieties have also been planted to carry on the orchard’s legacy. Each year, members of the community group responsible for Swains Lane’s upkeep run a variety of education activities within the reserve. Ongoing work also includes mowing walkways, managing pond vegetation and general site maintenance. All the hard work at Swains Lane has had a positive impact on the quantity and quality of local wildlife. These improvements have also raised awareness and connected locals with the nature on their doorstep.